Hanon The Virtuoso Pianist is a famous set of finger exercises for pianists. In this piano lesson you can print all the piano exercises for free and get tips on how to practice the three different parts for the best results. Charles-Louis Hanon (2 July 1819 – 19 March 1900) was a French piano pedagogue and composer who wrote a very famous set of finger exercises for pianists. These exercises were meant to not only help improve technique, but to build it all the way from the beginning to advanced level. Hanon's Le Pianiste Virtuose, which is in three parts, has become a staple for serious pianists. The three parts consists of finger exercises getting gradually more and more difficult, from a beginners to an advanced level. 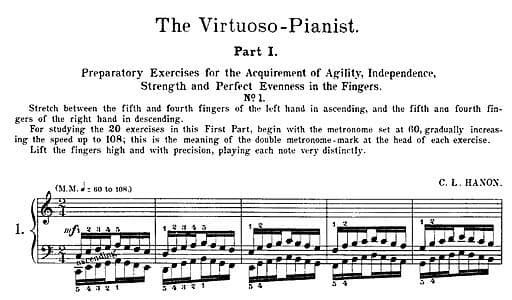 The first part of Hanon the Virtuoso Pianist consists of purely technical "finger" exercises. I suggest using between 5 and 20 minutes per day for this type of 5-finger practice when you need to develop more "nimble" fingers. Here are some tips on how to practice with good results. in the very last measure. In between these places the pattern is simply repeating one note higher, versus one note lower each time! Learn these measures well, playing very slowly first hands separately, then both. Then learn it by heart so you can focus on the keyboard and your hand position instead of the notes. Play the whole exercise through as quarter notes. Play the whole exercise through as eight notes. Play the whole exercise through as sixteenth notes. Play one note long and the next short for a simple rhythm. Reverse and play short- long. Play your right hand louder than the left. Play your left hand louder than the right. Take turns playing loud and soft between the hands, and do frequent changes- Fun! Tip: Take your time learning the first 10 Hanon exercises one by one. Keep repeating the ones you have learned until you have mastered all 10. You can now play through all 10 each day as a warm up. Then start new with the next set of 10, and leave the old. These exercises are similar to the first part, they just are made as longer patterns. But by now you will learn each pattern much easier and quicker, since the reading and understanding of what might have seem as a scary bunch of notes (!) before will seem really easy now. Use the strategies for practicing as above; maybe skip steps 1, 4 and 5 if you wish. This part of "Hanon the virtuoso pianist" also contains all the major and minor scales, chromatic scales, arpeggios and chord practice. Part 3 of Hanon the virtuoso pianist is not for beginner pianists, here you need to be careful and listen to your body. Playing the piano should never hurt and you should take a break if you feel any fatigue! This is important! For smaller hands, take it in small doses with the stretching exercises, and again listen to your body! Combine a couple of these exercises each day with a few of the exercises that you have learned from part 1 and 2. In this way you will have both finger, stretching and strengthening exercises. You could also select a “repertoire” of different Hanon exercises that you like, and that feels good to play, for a 10-20 min. "exercise program". Learn them by heart and use as a "tailored to your needs" daily warm up. The suggestions written in the book should be followed with carefulness though. I would strongly advice against recommending anyone, as Hanon does in the book, to “continue playing at a slower tempo if the wrists get fatigued, and then gradually increase speed as the fatigue goes away”, Warning! this would be asking for trouble!! If at any time your wrists or arms feel fatigued: TAKE A BREAK! Or play something else. Do not try, as also suggested by Hanon, to play through the whole book every day, as you can get some serious injury. And, as always when practicing- remember to take breaks every 20-30 minutes to stand up and stretch. It's a healthy habit. Read more about how to practice without pain here: Learn How To Play Piano Pain Free. They do help to quickly improve finger dexterity and technical skill. They also help to develop a familiarity with common patterns both of body/arm/hand movement, and of note reading patterns. Hello, I'm Maria your online piano coach. 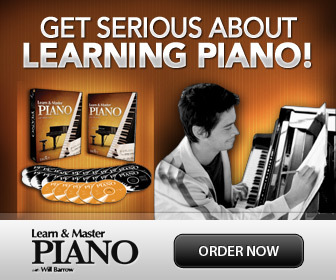 If you want to get help and tips on how to get started playing the piano, this site is for you. Read more here. Get a free monthly newsletter with piano lessons, practice tips and musical inspiration delivered straight to your inbox! Learn to about musical meter and the difference between simple and compound meter by listening and exploring the beat in this free music theory lesson. Learn how different music note symbols that show the note values, (or how long or short a note is) are written. It may seem that time signatures are not important to pay any attention to, but they do give us a lot of information that is useful as you learn a piece. Many are confused about simple meter vs. compound meter. To make matters worse, meter can also be duple, triple and quadruple. Don’t worry- here is help! Intervals are the distances between notes. Learning how to identify music intervals, helps you to read notes quicker, among other things! Copyright © 2010-2019 OnlinePianoCoach.com. All Rights Reserved.